जुगनू कैसे चमकता है ? How Firefly shines ? ऐसी क्या जरूरत पडी कि जुगनू या अन्य जीवों के अंदर चमकने जैसी क्रिया विकसित हुई? कैसे बनती है आईसक्रीम What's in the Icecream ? कौन होगा जिस ने आईसक्रीम ना खाई हो और देख देख के लार ना बहाई हो यह वो खाद्य है जो बच्चों किशोरों बड़ों सब में लोकप्रिय है उन सब का पसंदीदा है आज ये जाना जाएगा कैसे बनती है यह लज़ीज़ आईसक्रीम ? परंतु क्या आईसक्रीम सचमुच ताज़ा दूध,मक्खन,मलाई,फलों आदि से ही बनती हैं? नहीं? 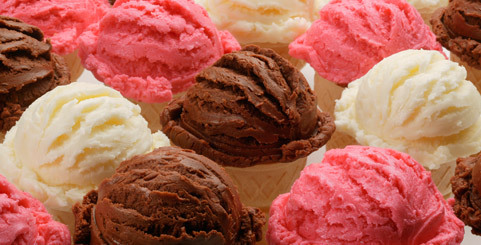 Polysorbate 80 is an emulsifying agent, often used in ice cream to prevent milk proteins from completely coating the fat droplets. This allows them to join together in chains and nets, to hold air in the mixture, and provide a firmer texture, holding its shape as the ice cream melts. Similar compounds are polysorbate 60, polysorbate 65, etc. Lecithin is often taken as a dietary supplement, since it contains the B vitamin choline.Lecithin is the emulsifier in egg yolks that allows the oil and water to mix to make mayonnaise. Mono-glycerides are used as emulsifying agents in many products, such as baked goods, whipped cream, and ice cream.It is a fat that is missing two of its fatty acids. It is often used with di-glycerides, which are fats that are only missing one of their fatty acids. Sodium citrate is used in ice cream to keep the fat globules from sticking together. Citrates and phosphates both have this property.It is also an anti-coagulant.As a sequestering agent, sodium citrate attaches to calcium ions in water, keeping them from interfering with detergents and soaps.